The word Hybrid does not mean limited travel, but that’s what people think when they see the vehicle is electric-powered. The truth is, a hybrid or plug-in hybrid vehicle travels the same distances conventional gasoline-powered vehicles do -and father. The difference is that hybrid gives you the power of electricity combined with a gasoline engine. The union benefits drivers who travel within 20 miles or they make extended-travel part of their daily routine. 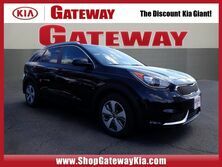 If you live near Warrington PA and looking for the nearest Kia dealership, Gateway Auto Sales knows exactly how a hybrid vehicle can work best for you. Remember, a hybrid or plug-in hybrid vehicle combines the benefits of using electric-power for local travel with the extended travel range of a gasoline-powered engine. 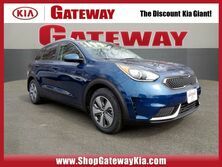 If all that sounds attractive, then the 2019 Kia Niro Plug-In Hybrid might be your solution to stretching that gas mileage. To offer you a clearer view of options, in this article we’re comparing two plug-in hybrid vehicles. There other plug-in hybrids to consider, such as the Mini Countryman SE Hybrid Plug-in Crossover SUV and the Subaru Crosstrek Hybrid. Gateway Auto Sales may have those vehicles on our used car lot in Warrington PA. Nonetheless, for this article, we’re comparing the Niro Plug-In Hybrid to the 2019 Toyota RAV4 Hybrid. 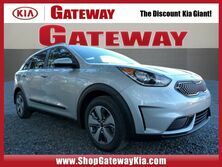 See the Niro Plug-In Hybrid at Kia Warrington PA! Keep in mind, the Niro Plug-In Hybrid is nearly identical to our standard Niro hybrid. A larger battery makes the difference. Kia battery technology gives up to 26 miles on electric-only power and the option to be recharged with an external power source. After 26 miles, the Plug-In operates and feels like the standard Niro and averages 105 mpg combined. 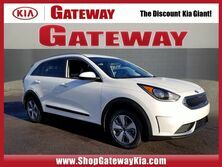 These averages are great for anyone searching “Kia dealership near me” and living close to our Gateway Auto Sales in Warrington PA. In comparison, Toyota’s hybrid is not a plug-in, so it does not operate solely on electric power. However, the RAV4 Hybrid does accomplish a fuel economy of 32 mpg combined. Accordingly, conventionally powered rivals cannot match such savings at a reasonable price. Both the 2019 Niro Plug-In Hybrid and 2019 Toyota RAV4 Hybrid are easy to get in and out of and both offer plenty of leg room. And while both models have interior features that are very easy to use, the Toyota RAV4 seems dated. Kia is the industry leader where comfort and design are concerned, so they are always well-equipped off the line. On the other hand, the RAV4 Hybrid seems cheaply made. The installation of hard plastic throughout the interior and the rough utilitarian design degrades the visual senses. Finally, each vehicle has smartphone integration technology and standard driver-assist options like Blind Spot Warning and Lane Change Assist. They also include Anti-lock Brakes and Side/Curtain airbags. Where we thought the Niro Plug-In Hybrid faltered was in its small cargo space behind the rear seats when in the upright position, but the Toyota RAV4 is even smaller. Unmistakably, the Kia scores higher, but compare for yourself. 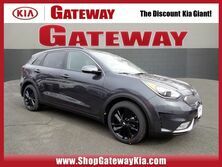 If you’re looking for a Kia dealership near me and live close to close to our Gateway Auto Sales in Warrington PA, then call ahead and schedule a test drive or stop in. We’ll be happy to answer all your questions.